The year was 1986. Top Gun and Ferris Bueller dominated the silver screen, while Whitney Houston and The Beastie Boys ruled the airwaves. 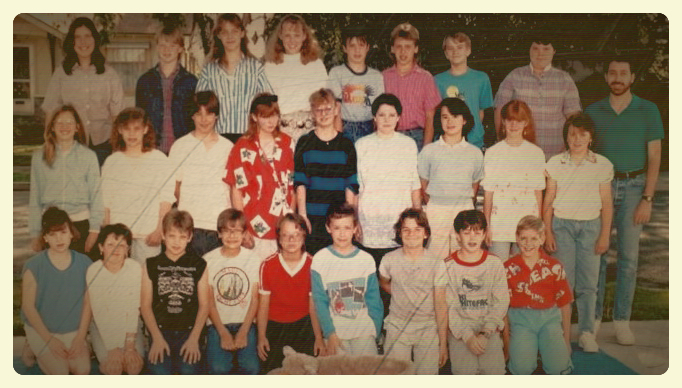 Walking into my 6th-grade classroom on the first day of school, I was a punk. Being only my second year in public school after transitioning away from a strange combination of home school and private school, my rebellious spirit had blossomed into full-fledged obnoxiousness. I had a chip on my shoulder, the last thing a four-and-a-half-foot boy should be packing around, but my mouth overflowed with biting sarcasm. Not a day went by when I wasn’t in trouble with my father and on the receiving end of a two-by-four swung at my backside like a designated hitter warming up for the Yankees. Up to this point in my life, the only male role models I had in my life were the kind of men who believed children should be seen and not heard, only without the “seen” part. To me at this time, being a man meant being violent in so many ways: violence to solve problems, violence to prevent problems from happening in the first place, and words double-dipped in violence to show a guy meant business. Aside from violence, the only other “manly” trait I had learned from my father was a savage and cannibalistic sense of competitiveness. Win at any and all costs, because winning was all that mattered. Back to the first day of school, as we entered the classroom as big, bad 6th-graders, who ruled the school as far as we were concerned, we were greeted by a male teacher. Wait, a man for a teacher? None of us had ever heard of such a thing. Mr. Ray was twenty-something, bearded and fit, and barely out of college, standing in front of a room full of 11 year-olds, confident and unfazed. It wasn’t long before we found out that he also drove a Porsche 914. Granted, this car was considered the “poor man’s Porsche,” but to a kid, it was enough to elevate him to instant stardom. We were in awe, and he oozed coolness. Within the span of the first week, my definition of what it meant to be “manly” was completely rewritten. Mr. Ray taught us sportsmanship by coming outside with us and playing kickball, tether ball, four-square, and even butts-up, a sadistic playground game invented by boys to hurt and humiliate one another. If someone threatened the integrity of the game, Mr. Ray was right there to remind us that a game isn’t worth playing if it isn’t worth winning – or losing – fairly. Granted, Mr. Ray was better at the games than we were, but when the occasion came up for him to go “butts up” to the wall, he took his punishment with a smile. Mr. Ray also redefined my competitive urges. Every Thursday was trivia day, and we would all have the opportunity to answer one trivia question from his Jeopardy-inspired board of questions. There were numbers on each question that correlated to the number of pieces of licorice they were worth. As the questions became more difficult, they were worth more, and subsequently, worth more than a mere sugar high – they also came with social capital. This presented a challenge, and soon, I found myself in the library on a daily basis, researching things like the colors of ink used in printing dollar bills (which was an extraordinarily hard one, I might add). Remember kids, this was before the internet. We still used card catalogs. By the end of the school year, our class had gone from a clique-ish bunch of ruffians to a cohesive, all-inclusive group, bonded together forever, or at least so it felt. Mr. Ray was concentrated gravity, and we were all drawn to him. I specifically recall one incident when I was having a particularly rough day, dealing with several issues at home, and he recognized it, pulling me aside to talk one-on-one. He exploded past the boundaries of his job description and union contract to become my informal counselor, even going so far as to let me cry on his shoulder as he hugged me and let me know everything would be okay. What Mr. Ray presented to me was something mightier than any of my father’s swings with the board or previous teachers’ threats of suspension or detention. He presented me with a fork. No, not the type of fork we use to shovel grub into our gobs, but the type of fork that presents a choice. He made me think critically about the future for the first time, and he did it by showing me what I could become. Mr. Ray stood at this fork in the path to my future, gently nudging me in the path less traveled. After I dropped her off, I headed to my office to look him up. I searched Facebook, but no luck, so I turned to Google. After manipulating a few search terms, I found him, but my discovery was bittersweet, ending in tears. The obituary I found stated that Mr. Gene Ray had passed away six years ago, at only 50 years old. Christ, I thought, that’s only ten years older than me. I guess it really is true that only the good die young. I turned to Facebook, partly to post an announcement of his passing, but mainly to lament the loss of someone who was a fork in my path. As I finished my post, I decided to tag the people from that ’86 class that I’m still friends with on Facebook, and that’s when I realized that most of us are still in touch. There was no other class of kids before or after that in my life history that had that kind of staying power, and that is a testament to a man who devoted his life to making the world a greater place, not only for himself, but for all future generations. As the news of Mr. Ray’s passing spread among those of us tagged, people started adding other tags that I was missing, including a kid – actually, a grown-up now – who I’ve wanted to reach out to for years now. See, my only regret from the year prior to meeting Mr. Ray was due to a fight that I started. It was the only fight I’ve ever been in, and I picked it. I was in a bad mood because my dad had been particularly cranky with me lately, and I was looking for an outlet to vent my anger. He was conveniently within my fist’s reach. I bloodied his nose, and it was for no good goddamned reason at all. I’ve regretted it ever since, but didn’t have the guts to apologize. News of Mr. Ray’s passing lit a spark in me that had been dormant for too long, and to honor him and what he taught me, I finally did it. I reached out via Facebook message, took accountability for my actions, and asked forgiveness for something I did almost 30 years ago. Today, I have a mended friendship and one less weight for my shoulders to bear, and good lord, does it feel good. What happened next was the twist of all twists, and to say that it shocked me, as so many articles in social media purport to have the capacity to shock (but usually fall short), is actually an understatement. The first version of this article went live on my website on Friday, May 16, 2014, at around 7:00AM. Why is this an important detail, you might wonder? Mr. Ray contacted me via my website’s commenting feature four hours later. No, this did not happen from beyond the grave, and no, I don’t need Ray Stantz, Peter Venkman, and the rest of the guys to come perform a nuclear exorcism of my computer. Mr. Ray is still alive. Turned out, it was his brother who passed away six years ago, who also happened to be a teacher, and who also looked remarkably like his brother, my teacher from so many decades ago. Once again, a social media story spreaded like wildfire, making it to his inbox in a matter of hours. The most beautiful ending to this story and the most magnificent beginning to another chapter of the tale happened next. We began emailing back and forth with one another: me, expressing all of the pent-up appreciation for his compassion and all of the lessons he left all of us with almost 30 years ago, and Mr. Ray, expressing his gratitude for hearing that his influence remained so strong among many of the students that crossed his path earlier in his teaching career. Thank you again, Mr. Ray, for instilling in me a desire to live in justice, pursue truth, and to always offer forgiveness and gratitude. This is one grown-up kid that still carries what you taught me, lessons that transcend the classroom and change lives, and I am extraordinarily grateful to be able to express it now, rather than when it is too late for you to be able to appreciate such sentiment. As with any memorable story, this one comes with a moral in the form of not just one, but TWO profoundly powerful lessons: 1) be somebody’s fork in the road, and 2) demonstrate your appreciation for those who are that fork in your roads while you still can. In my life, I can count all those who have been a powerful enough influence to change the course of my life’s path on one hand, and not all of them performed the profound transformations that Mr. Ray did. Some led by example, providing a light to follow during my darkest days. Another offered a kind word on my behalf without being asked, an act that led to a life-changing opportunity working with at-risk fathers who yearned for their own inspiration to do right by their families – forks in their collective road. Every day, we have the opportunity to change someone’s life. What can we all do today that will make this day worth remembering tomorrow for others, as well as ourselves? There is no question: we must be mindful enough to notice our moments – opportunities to be that fork. Furthermore, we must possess the initiative to act upon those moments. I enjoyed your first version of this post but LOVE this one so much more. It’s such a great story with that unexpected twist of Mr. Ray being very much alive. As a former teacher myself I can attest to being constantly amazed by the long-lasting impact of some of the words I uttered to my students. I’m glad that you’re going to be able to reconnect with this important man from your childhood. I look forward to reading about that meeting as I’m sure it will inspire a blog or two. I debated on holding off until such a meeting, but I couldn’t hold it in anymore. The story was too cool to not share! Thanks! Your story brought tears to my eye. Mr. Ray is a rare kind and you are exceptional to get what he tried to teach you at such a young age. It warms my heart to read it again and again. Thank You Dr. Miser. I’m a retired middle school teacher and the father of one of Dr. Misner’s classmates, Jonica (Parry) Crumley. A beautiful story beautifully told. I hope I had at least a sliver of the impact on my students that Mr. Ray had on his.